Glutamine, or L-glutamine, is a conditionally essential amino acid in humans. It is found in fairly high levels in dairy and meat products. Normally, it can be synthesized from another amino acid, glutamate, in adequate quantities. As a conditionally essential amino acid, glutamine must be included in the diet during conditions of extreme stress, such as injury, septicemia, burns and inflammatory bowel disease. "Glutamine is the most abundant amino acid in the skeleton, muscle and blood." Glutamine is the most abundant amino acid in the skeleton, muscle and blood. Glutamine reaches levels in the brain about 15 times greater than those of the blood, where it is used as both fuel and a neurotransmitter. Glutamine is also the preferred energy source of the cells lining the digestive tract, especially in disease states. The high levels of glutamine in the blood and intestinal lining reflect its importance in cell division. For this reason, glutamine is also essential to support normal wound repair. Glutamine levels are generally reduced in cancerous states, and even lower following chemotherapy. Consequently, glutamine supplementation is employed in cancer treatment in humans. As a bonus, it seems to protect normal cells from the effects of chemotherapy while enhancing the die-off of cancer cells. Why recommend administration of glutamine to my pet? 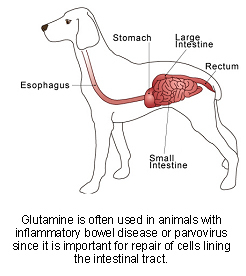 Glutamine is often recommended for pets with chronic bowel disorders including inflammatory bowel disease and parvovirus enteritis, since it is the preferred fuel source of damaged intestinal epithelial cells. Strenuous exercise, infection, surgery, and trauma can also deplete the body's glutamine reserves, particularly in muscle cells. Glutamine may reduce the gastrointestinal toxicity of some chemotherapy drugs and may minimize inflammation of the intestinal tract caused by radiation therapy. It may be a useful adjunct treatment for pets with suspected leaky gut syndrome, where increased intestinal permeability can lead to the development of food allergies or intolerances. How much experience is there with the use of glutamine in pets? Glutamine supplementation has been used relatively extensively in humans, dogs, and cats. Some studies suggest glutamine supplementation is beneficial to patients while others have demonstrated no benefit. Clinical trials in animals are lacking. Glutamine, as one of the body's main amino acids, is thought to be a safe supplement when taken at recommended dosages. "High dosages of glutamine may pose a risk to pets with epilepsy." High dosages of glutamine may pose a risk to pets with epilepsy. 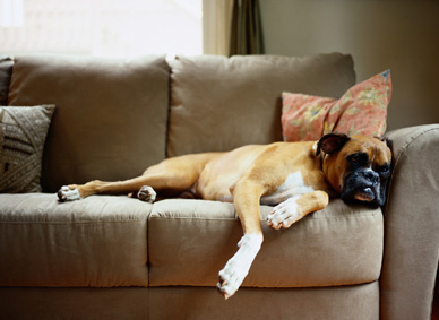 If your pet is taking anti-convulsant medications, glutamine should only be used under veterinary supervision. Where do I obtain glutamine and do I need a prescription? Pet owners are cautioned against buying supplements without knowledge of the manufacturer, as supplements are not highly regulated and some supplements may not contain the labelled amount of ingredients. Your veterinarian may have referred brands of supplements that he or she will recommend. A prescription is not needed for glutamine.